The P&L Burger (@thepnlburger), officially opening tomorrow on 507 Queen St. W., is Richard Lambert and Jesse Girard's latest venture. Lambert and Girard of The Social Group, also owners of Parkdale's Parts & Labour (@partsnlabour), West Queen West's The Dog and Bear, and The Hoxton, continues their collaboration with Executive Head Chef Matty Matheson (@mattydeathbro) in their new 1,000 square feet burger shop. I got a sneak peek (and taste!) 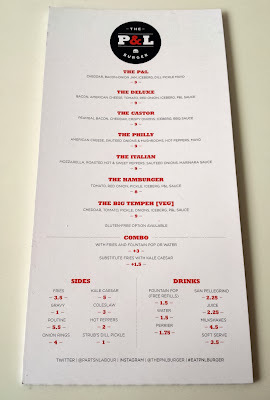 of The P&L Burger's burgers yesterday before their big opening day tomorrow. 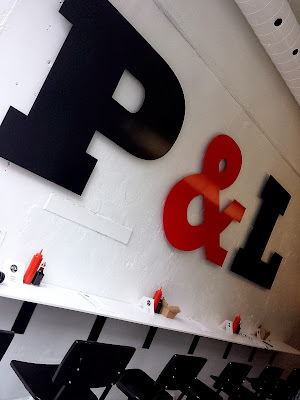 Designed by Castor Design, The P&L Burger's black, red and white themed space is clean, sleek and modern. No frills, no fuss. Counter seats only at The P&L Burger. The P&L Burger's hearty menu is inspired by chef Matheson's love for bold flavours and years of experience at restaurants such as Le Select Bistro, La Palette and Oddfellows. 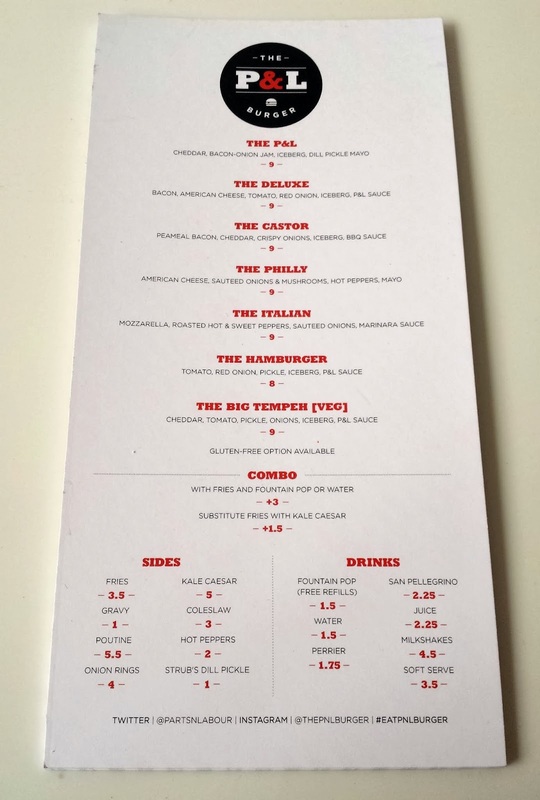 Listed first on the menu is chef Matheson's The P&L which won first place in the Toronto edition of Country Music Television's (CMT) Burger Wars, out-stacking The Burger's Priest and Dangerous Dan's Diner. The P&L boasts seven ounces of Ontario chuck (ground in-house daily), dill mayo, bacon-onion jam, iceberg lettuce and Monterey Jack cheese on a toasted Blackbird Baking Co. milk bun. All burgers can be ordered as a combo with fries and fountain pop or water (+$3). Fries can be substituted with kale caesar salad (+$1.5). Gluten-free option is available. After trying a few bites of all the burgers, I would have to say my favourites are: THE CASTOR (that maple BBQ sauce won me over), THE DELUXE with its bacon and P&L sauce which consists of ketchup, mustard, red onion, pickles, mayo sriracha and pepperoncini, and last but not least the award-winning THE P&L (bacon-onion jam...'nuff said). For those of you who like a bit of heat will enjoy the saucy, mozzarella-topped THE ITALIAN, and the cheese-oozing THE PHILLY with its mushroom and sauteed onions is sinfully hearty.